Tootie and I just spent four nights in New Orleans. We keep bicycles there at our friend’s house. 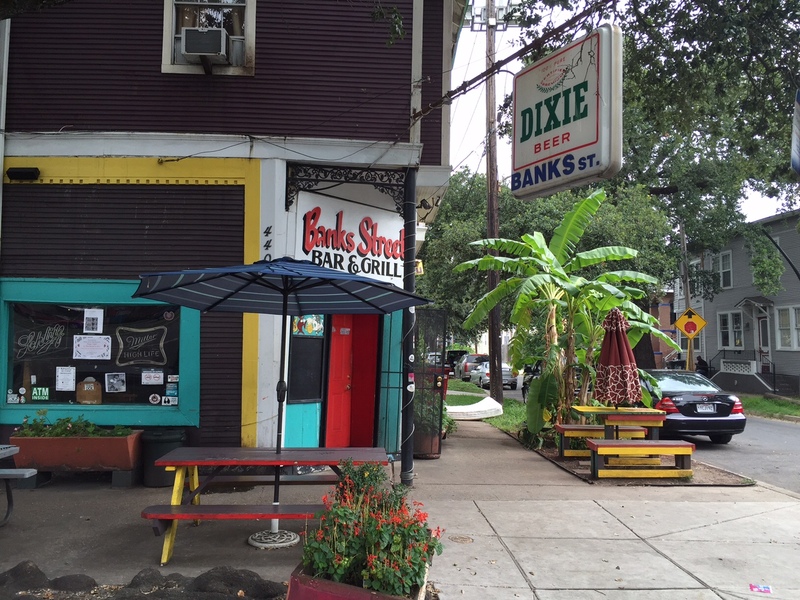 Much has been written about New Orleans since Hurricane Katrina in 2005. A lot has changed in the ten years since the devastating flood caused by the failure of the levies. The population declined when over a hundred thousand people, mostly poor and African American, failed to move back following their forced relocation because of the storm. In recent years thousands of young people, mostly college educated and middle class, have relocated to the city from other parts of the country. Working class Hispanics have also moved to a city that previously had very few. 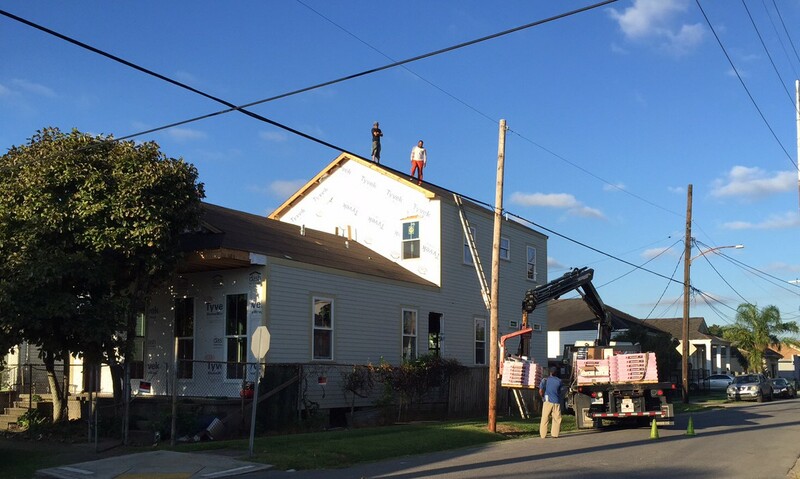 In some ways, New Orleans is becoming more like America. This is not completely a bad thing. 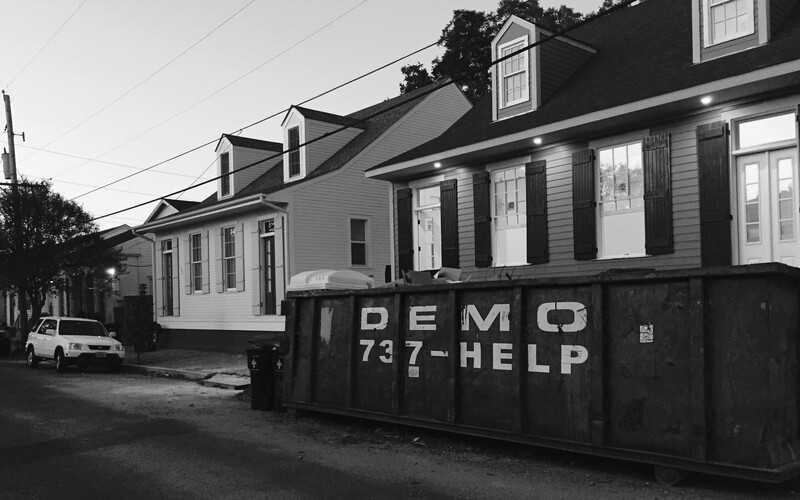 Will New Orleans lose its soul in the process of solving some of its societal problems? Only time will tell. Crime is still a problem in New Orleans. But in the same trend as other big cities, neighborhoods that previously were considered unsafe are now considered safe. In New Orleans many federal housing projects were been closed after the storm. In some areas attractive new housing has been built by the housing authority, although local activists say it is not enough. Because these former housing projects were seen as sources of crime, the neighborhoods surrounding them are now considered much safer. This may be one of the reasons for an explosion of housing prices, particularly in certain areas of Uptown. Tootie lived with Tom, Slice, and me at 913 Second Street in 1981-82, in the Irish Channel neighborhood of Uptown. This is how it appears today; very similar to its appearance back in the day, the center house in the picture. Back in 1981, this was considered “the frontier.” At my air freight job at the time, a macho truck driver who lived in the suburbs (and probably carried a gun) told me he did not want to go into my neighborhood even in the daytime. When we lived there, we only walked in one direction, the block and a half towards Magazine Street. Even though the neighborhood stretches seven blocks the other direction, towards the river, in my young and foolish days we never ever went that direction, even in a car. Now the entire area is gentrified, and houses five or six blocks towards the river from my old house are selling for many hundreds of thousands of dollars. Young people in their twenties circle around on bicycles. In the spaces where old houses had been torn down or had collapsed, there now is new construction, imitating the old style. These houses are being built near Eighth and Chippewa. 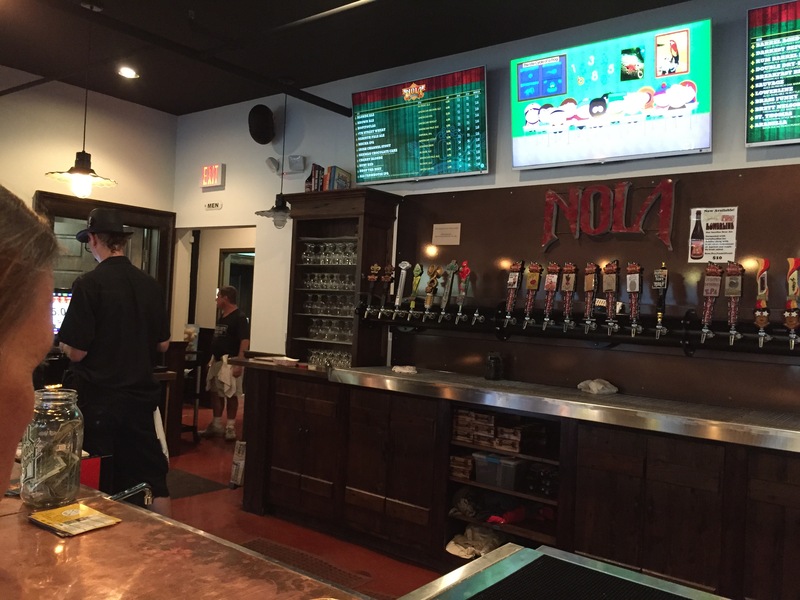 On this trip, Tootie and I biked to have a beer at Nola Brewing, the tap room of a local brewery in that formerly dangerous direction (corner Tchoupitoulas and Eighth) where the room was filled with tatooed hipsters. Further uptown, again on the “wrong” side of Magazine, there is a similar trend. Renovations and new building were everywhere. Checking real estate listings, almost nowhere uptown is affordable any more, almost everything is more than three hundred thousand. Even worse, very little seems for sale. 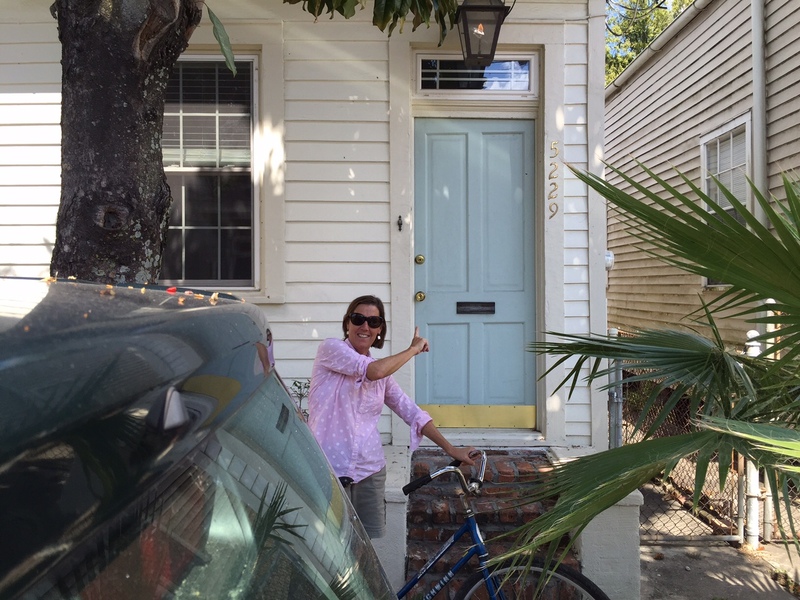 Back in the day, after we lived on Second Street, we bought a house on Annunciation Street, which we sold for a loss in 1990 for $ 35,000.00. It had been on the market for two years, and no one would even look at it. Now it must be worth way over $ 300,000.00. 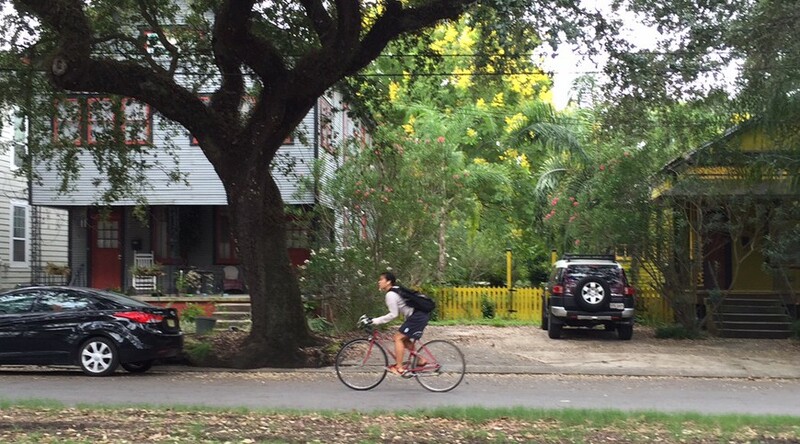 Parks all over New Orleans seemed spruced up, even in poor neighborhoods. In the eighties, this park was a barren spot for the homeless and for drug deals. 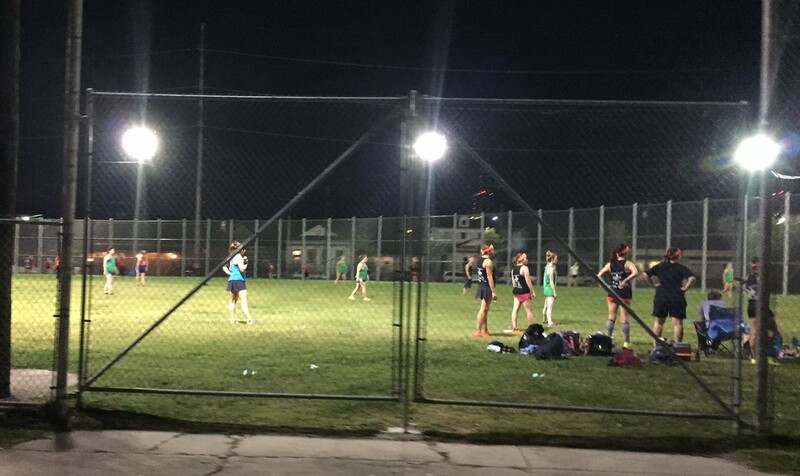 Now at night it had a young adult’s kickball game. One day Tootie and I biked out of Uptown to the new Lafitte Greenway bike path, which goes from the French Quarter to City Park, crossing an area that even current locals might not trust as safe. It seemed fine to us. 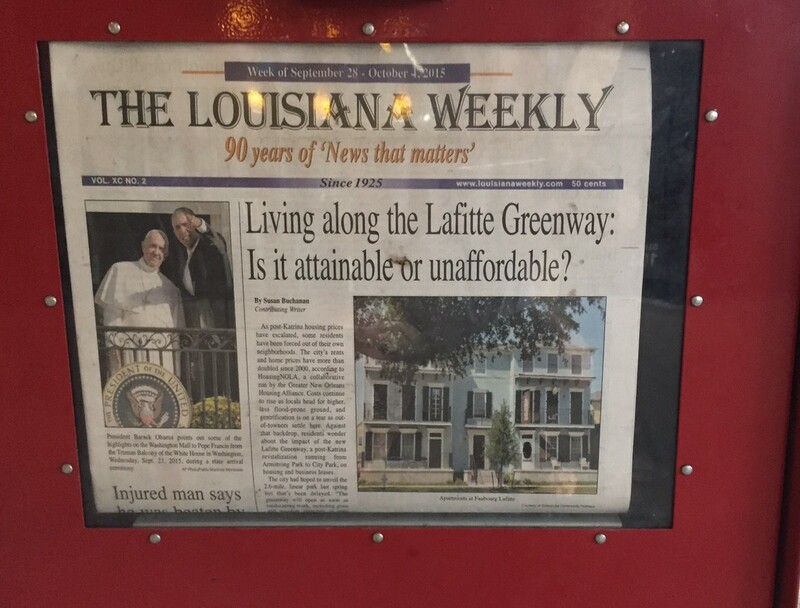 Later, I talked to one young man who worked in a wine shop back Uptown; he had just bought a house in that Lafitte area, because it was the only place he could find something affordable. The storied local newspaper of the African American community is already questioning the bike path, implying that it is just going to promote gentrification and higher rents. In the four days there, Tootie and I biked all over the city. 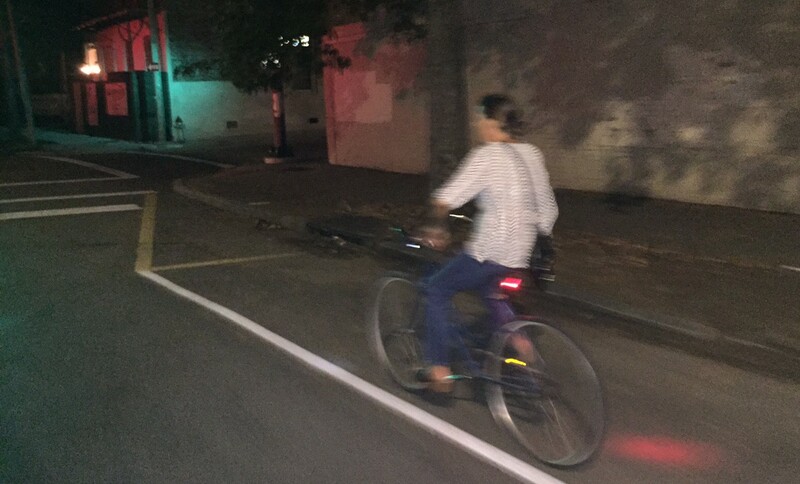 We rode home one night from an expensive meal at the restaurant Herbsaint. 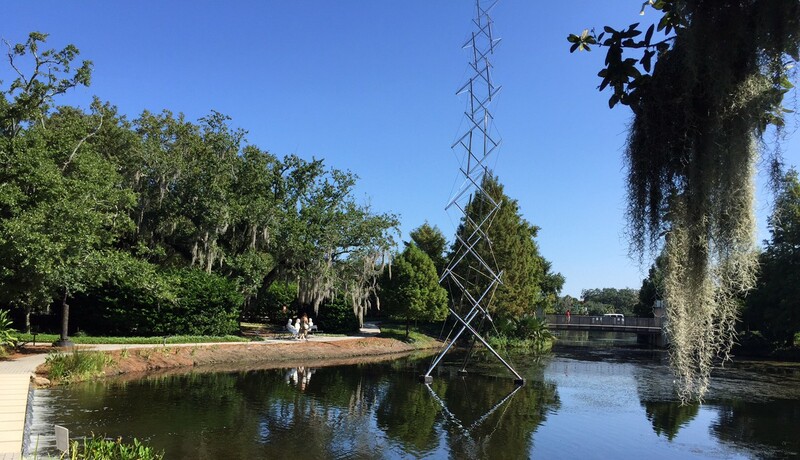 The next day, we discovered a glorious sculpture garden next to the art museum in City Park. I also rode around by myself on Friday morning. 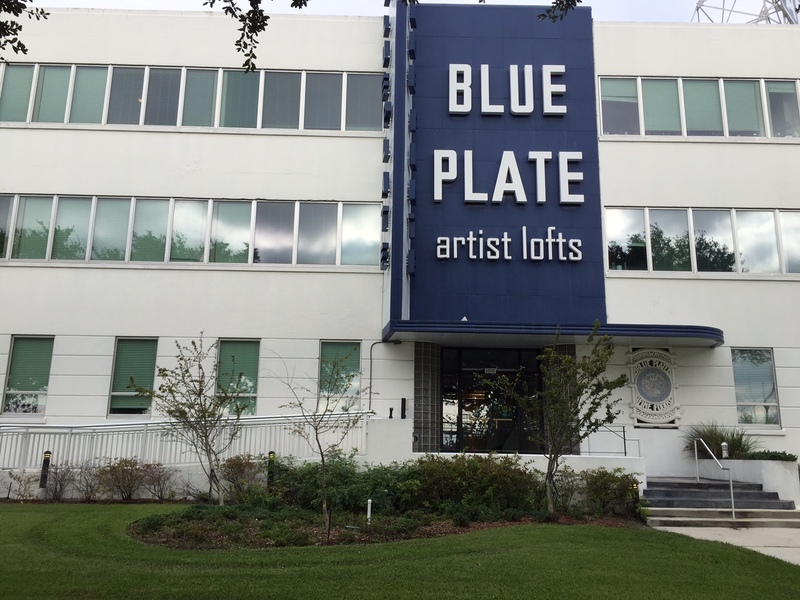 Some parts of the city that were flooded during Katrina have not been completely brought back to life. These parts are both physically and psychologically distant from the glories of Uptown. Even here, around the corner from that abandoned house, this former mayonnaise factory, which had sat empty for years, seems to be coming to life. 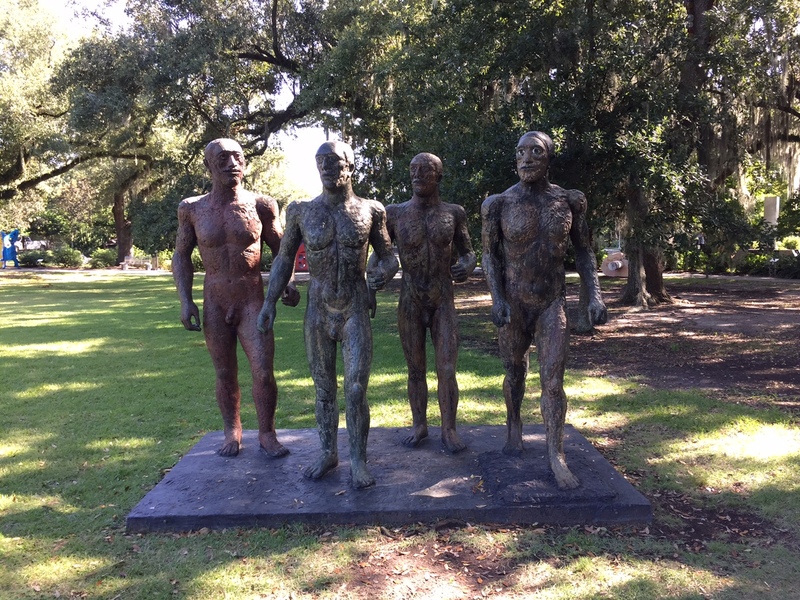 I enjoyed looking around Mid-City. It passed my litmus test of livability and bicycleability: you see women feeling safe to ride bicycles, even with no helmets. I had never even been on Banks Street before, beautiful streets like this seem a dime a dozen. 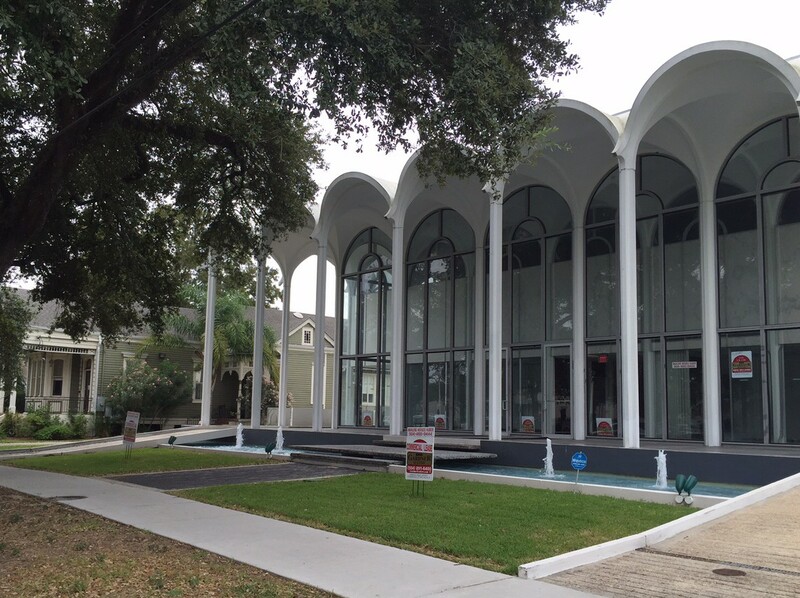 New Orleans does seem to be preserving some of its mid-century modernism. Out on Canal Street, this building looked recently renovated. I hope they find a tenant. 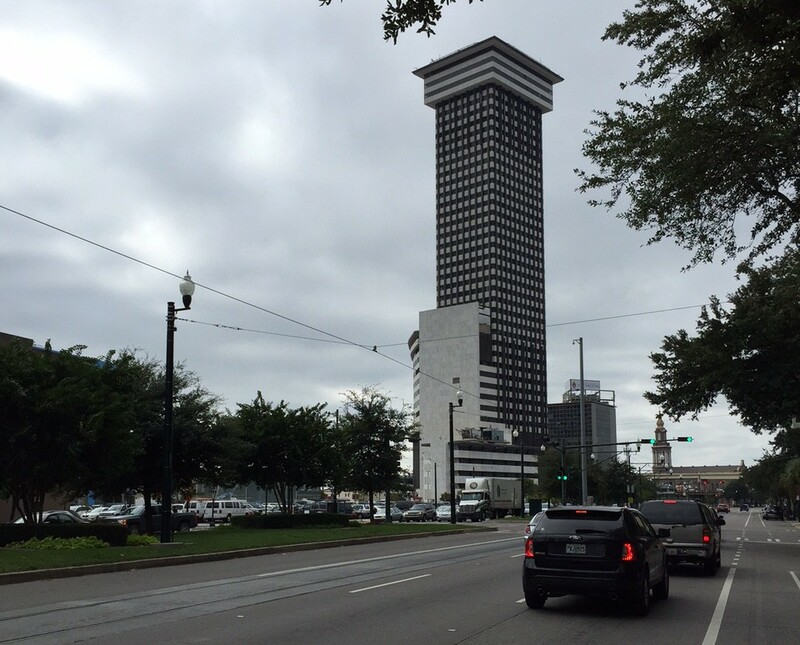 Plaza Tower is a sadder story. It was opened in 1969, and locked shut only thirty-three years later in 2002. Several attempts to convert it to other uses have failed. Even now, it is in a not-so-great location. It sits abandoned, soaring forty-five stories into the sky.